Over the years, scientists have learned a lot about DNA. Nevertheless, the molecule continues to surprise us with its exquisite design. Not long ago, scientists demonstrated that a single gram of DNA can store about 500,000 CDs worth of information. It has also been shown that the code used by DNA to store this information has been specifically designed to allow living organisms to respond to their environment in many different ways. In addition, we know that DNA stores its information in “modules” that can be rearranged in many different ways. This allows a single stretch of DNA to contain many different meanings, depending on how the modules are put together. 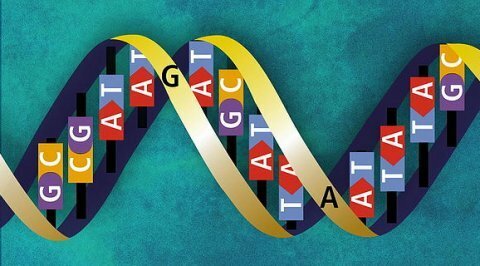 In the December 13 issues of Science, researchers have demonstrated yet another incredible design feature of DNA, and according to the University of Washington, the scientists who made the discovery were “stunned.” To understand what was done and what the discovery means, however, you need a little bit of background information on DNA and how it is used by the cell. DNA stores its information in sequences of nucleotide bases called adenine (A), thymine (T), guanine (G), and cytosine (C). As shown in the illustration above, those nucleotide bases link together to hold DNA in its familiar double helix shape. The meaning of each sequence depends on where it is in the molecule. In many organisms, a small fraction of the DNA is made up of genes, and in most of the organisms with which you and I are familiar, the genes consist of two regions: exons and introns. The exons of a gene contain the recipe that tells the cell exactly how to make a protein. This recipe is given in groups of three nucleotide bases, which are called codons. Each codon specifies a certain chemical called an amino acid. When the cell stitches amino acids together in the sequence given by the codons, it makes a useful protein. Now don’t get lost in all the terminology. Think of it this way: genes tell the cell how to make proteins. However, to increase the information storage capability of DNA, these genes are split into two regions: exons and introns. The introns separate the exons into modules of useful information, and the cell stitches those modules together in different ways so that a single gene can tell the cell how to make lots and lots of different proteins. In most organisms with which you and I are familiar, however, genes make up a tiny percentage of the DNA. The rest of the DNA is made up of what are called non-protein-coding sequences. While these sequences were also once derided by evolutionists as “junk DNA,” the more scientists learned about genetics, the more nonsensical that term became. We now understand that a large amount of non-protein-coding DNA is very important and is mostly used for regulatory purposes – it controls how the cell uses its genes. The most detailed look at the human genome yet, called the ENCODE project, tells us that the vast majority of this non-protein-coding DNA is functional. One way this non-protein-coding DNA controls the use of genes is through sequences called transcription factor binding sites. These are sequences to which a molecule (called a transcription factor) can attach. When the molecule is attached to a site, it can cause the cell to use the gene either more frequently or less frequently, depending on the specific chemical interactions involved. With all that terminology under your belt, you are ready to see the importance of the study published in the current issue of Science. Until now, it has been thought that only the non-protein-coding parts of DNA are involved in regulation. So while the genes tell the cell how to make proteins, the non-protein-coding sequences tell the cell how often to use those genes. This “separation of function” makes perfect sense to you and me, but it turns out to be incorrect! In the study, the scientists took DNA from 81 different types of human cells and added an enzyme that breaks apart the DNA. This particular enzyme, however, cannot break apart DNA sequences to which a transcription factor is bound. Thus, if a section of DNA has a transcription factor bound to it, it will not be broken apart. When the scientists examined what parts of the DNA weren’t broken, they found a significant number of codons! In fact, they say that at least 14% of all nucleotide bases in codons are in contact with a transcription factor, and at least 87% of genes contain such codons.2 I say “at least” because there are a lot more than 81 different cell types in humans. As other cell types are investigated, the percentages will almost certainly increase. What’s the big deal? Why does it matter that some codons have transcription factors bound to them? Because that means some codons are involved in regulation! This tells us that there isn’t a clear “separation of function” when it comes to regulating how genes are used. Non-protein-coding sequences regulate gene activity, but the genes themselves also regulate gene activity. This tells us that DNA is even more efficient when it comes to information storage than anyone ever thought! After all, genes have to be regulated. Since the genes do some of that regulation themselves, the non-protein-coding regions don’t have to be as long as they otherwise would be. As a result, DNA stores more information in a smaller package! These new findings highlight that DNA is an incredibly powerful information storage device, which nature has fully exploited in unexpected ways. Indeed. DNA is an “incredibly powerful information storage device” that is light years ahead of anything that modern human engineering can produce because it is the work of an all-powerful Creator. 1. Guilherme Neves, Jacob Zucker, Mark Daly, and Andrew Chess, “Stochastic yet biased expression of multiple Dscam splice variants by individual cells,” Nature Genetics 36(3):240-246, 2004. We haven’t yet been able to work out the algorithms to effectively do anything like that on purpose with information storage. There’s no way that could be an accident. The brilliance behind how this works far exceeds our own intelligence. An important thing to note is that transcription factors can be anything. From proteins to external physical properties such as temperature. These transcription factors are either inhibitors or promotors of what ever binding site they are attach to. Promoters help guide the enzyme RNA polymerase to the transcription site while inhibitors prevent them from attaching. Yet the binding site itself does not need to be used to influence the transcription of that gene. Other transcription factors cause the histone to contract which coils the DNA covering the binding sites all together. Proteins that always need to be in the proper ratio with one another will be transcription factors to one another. These feedback loops can be used to trigger the production of different genes once a particular protein has reach the desired concentration. The complexity of the DNA coding process intrigues me and is the inspiration behind many of my program designs. If you are going to copy an engineer it might as well be the best! Thanks for your comment, Aaron! One thing I would correct, however, is that transcription factors are always proteins. They can be promoters or inhibitors, but they are proteins. I think what you meant to say is that lots of different things, including external physical properties like temperature, can affect the activity of a gene. If it is suggested that frequency of this uptake mechanism is regulated could it be inferred that incremental frequency as it relates to production might control variability as well? For example if it is necessary to wait a certain amount of time for a duplication of the identical molecule requires a different span of time adding a third variable in the same space. I am not sure I understand your question, Doug. Most transcription factors do work by making the cell wait before it can transcribe the gene again. The more of those transcription factors there are, the longer the cell has to wait. I don’t see how this adds a third variable, though. Is it possible that there is a change in the delay mechanism based upon frequency or ordering of adjacent positioning exons. The order of the recipe such that time by itself adds a difference. 1+3+2 in this case yields a different result than 1+2+3. Not that longer chains require longer delays..
Doug, light and sound don’t seem to have any effect on the expression of genes in the body as a whole. There is probably some effect that sound has on the expression of genes in the ears and auditory detection systems of the body, but I doubt that the effect is direct. It’s certainly possible that the delay mechanism depends on the order in which the exons are spliced together. I don’t know of any research that indicates this, but it is certainly a possibility. Or perhaps 1+1 may change the next N in the order because of time or proximity or delay or maturation or within the N ordinate that proceeds with effect or affect on the preceeding exon(s) despite segregation. Or that a certain Nth in the chain is more influential than others or the last in the chain actually changes either order or the actual exon to something else. These questions unfortunately show great ignorance on my part but other variables besides time would be more obvious. Maybe proteins have different molecular weights or a varied gravitational force based on space between identical exons. Or maturation rate changes for identical exons. Or maybe because “sound” or frequency or resonnance has influence not just temperatures. The physical manifestation of vibration within may be another determinant. Ill stop asking stupid questions now. Thank you. Maybe some different spectrum of light adds variability down the length of the vertical axis of the chain. I’m done.